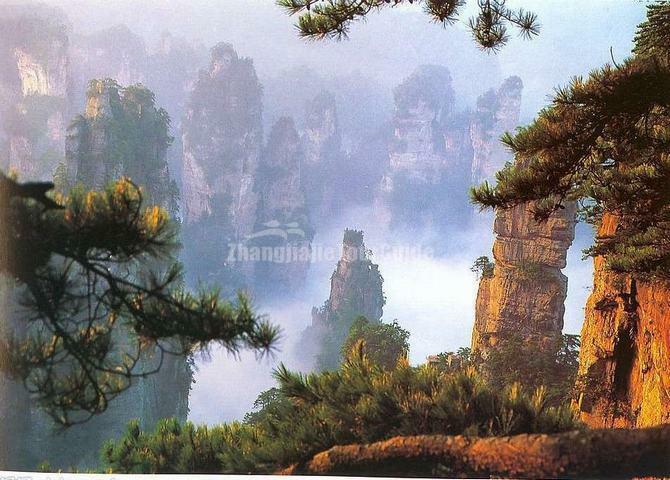 Zhangjiajie National Forest Park, the oldest, one of the largest, and probably the best-known national park in China. 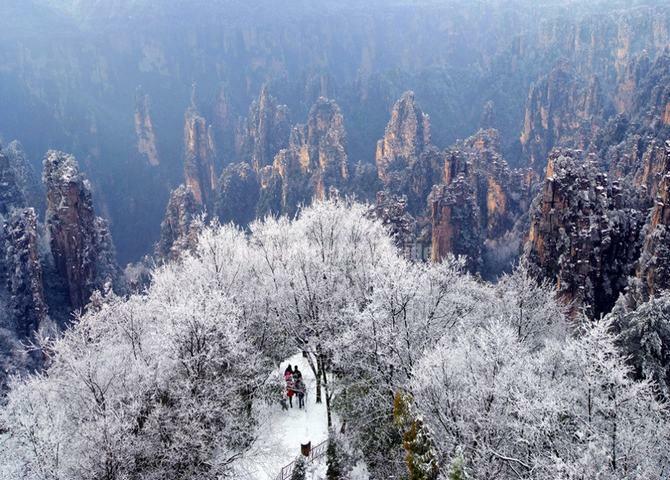 Since its designation as a national park in 1982, Zhangjiajie National Forest Park has been a cherished part of the the Wulingyuan Scenic and Historic Interest Area's rich tapestry. 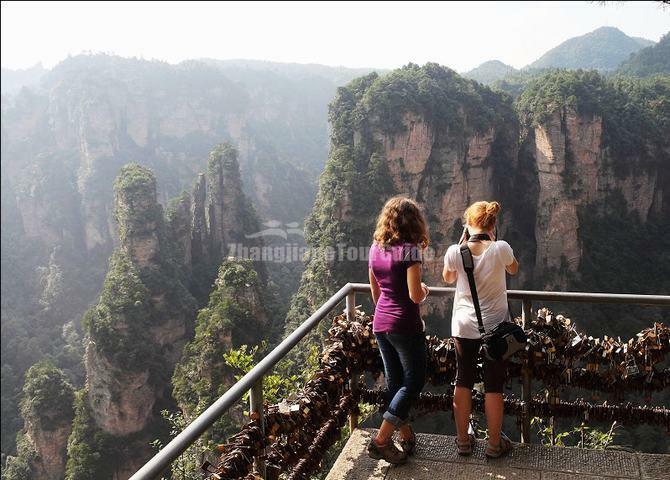 The park is about 35 km away from the downtown area of Zhangjiajie City. Covering an area of 130 square kilometers and neighboring the Suoxiyu Nature Reserve and the Tianzi Mountain Nature Reserve, the park is noted for its queer quartz-sandstone pillars and peaks, tranquil valleys and water, and beautiful forests. And being one of several national parks within the Wulingyuan Scenic and Historic Interest Area, the park was listed as a UNESCO Global Geopark in 2004. 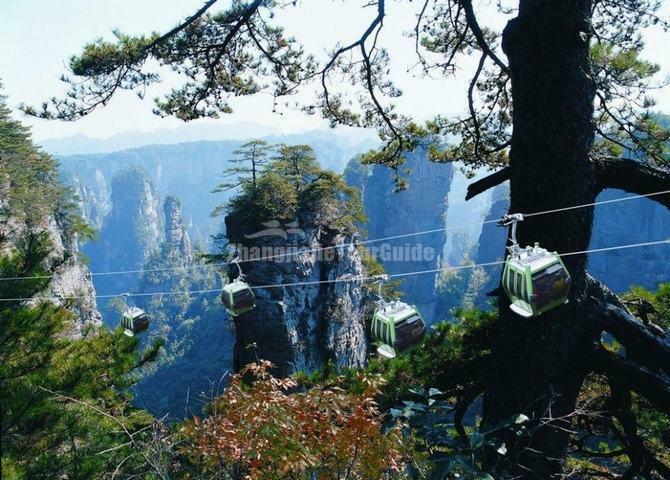 To explore the Zhangjiajie National Forest Park, you can take the 7 touring lines: Golden Whip Stream Scenic Area, Yellow Stone Village Scenic Area, Yaozi Village Scenic Area, Piapa Stream Scenic Area, Shadaogou Scenic Area, the Back Garden, and Chaotianguan Temple Scenic Area. These beautiful scenic areas will take you into a special wonderland. Also known as Huangshi Fort, it is named after a hermit Huangshi, about 1200m above the sea level. It is higher on the south and elevated by stiff cliffs, covering an area of 16.5 hectares. It provides the largest collection of marvelous spectacles and also provides the largest sightseeing terrace above the sea level in Zhangjiajie National Forest Park. If you stand on the terrace and watch as far as you can towards the south, you can see all kinds of queer pinnacles. If you watch towards the east, you can see numerous grotesque peaks by the Golden Whip Stream which resemble a clear, crystalline jadeite. Hence, there is a saying: “It can't be said that you have been to Zhangjiajie without reaching the Yellow Stone Village." Located in the east of Zhangjiajie National Forest Park, named after the 380-meter high Golden Whip Rock, Golden Whip stream meanders 7.5 km. Flowing from Laomo Gully first to Confluence of Four Rivers then to Suoxi Stream, it finally joins Li River, one of the four rivers in Hunan Province. It flows between steep grotesque peaks and luxuriant trees. Here, the meandering streams, the crystal-clear waterfalls, exotic plants and rare animals co-exist and constitute the extraordinarily beautiful, tranquil and natural ecological environment. No wonder it is called "the most beautiful valley in the world" and "the most poetic stream". Golden Whip Stream will not stop even if it has long drought. Major attractions along the stream includes Chupajie Carries His Wife, Golden Whip Rock , Candle Crag, Scholar Hides His Books, Getting together from Far Away, Magical Hawk Protecting the Whip, Great Writer Crag, Mother and Child Peak, Splitting the Mountain to Save Mother, and so on. Yaozi Village (Yaozizhai) situated in the northeast of the Zhangjiajie National Forest Park, and rising 1500 meters above sea level. The area is famous for its dangerous precipices and cliffs, even the "Yaozi" (sparrow hawk) cannot fly beyond it. If you like to explore little-visited mountain in Zhangjiajie, Yaozi Village Scenic Area is the best place which is quiet and has fantastic scenery, professional photographer picture-shooting base. Hiking in Yaozizhai is really a lot of fun: the ecological environment at this summit is outstanding, possessing an abundance of ancient trees, some more than 1000 years old. What's more, scores of birds nest in these trees. 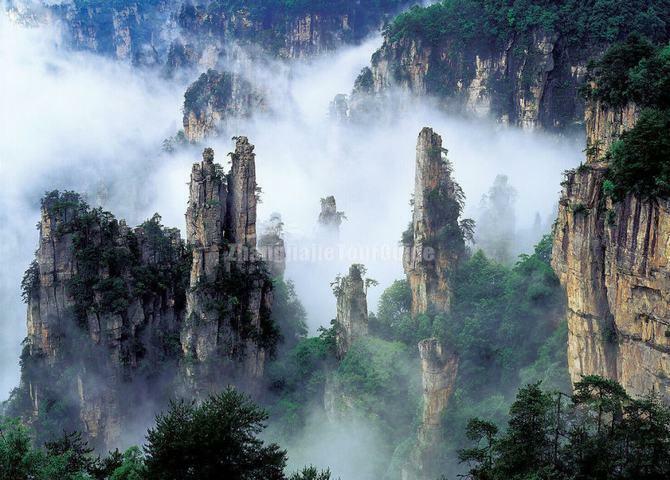 Yuanjiajie (boundary of Yuan family) Scenic Area is situated in the northern part of the Zhangjiajie National Forest Park.It has become more popular as the Southern Sky Pillar inspired the floating mountains in the Hollywood blockbuster Avatar. 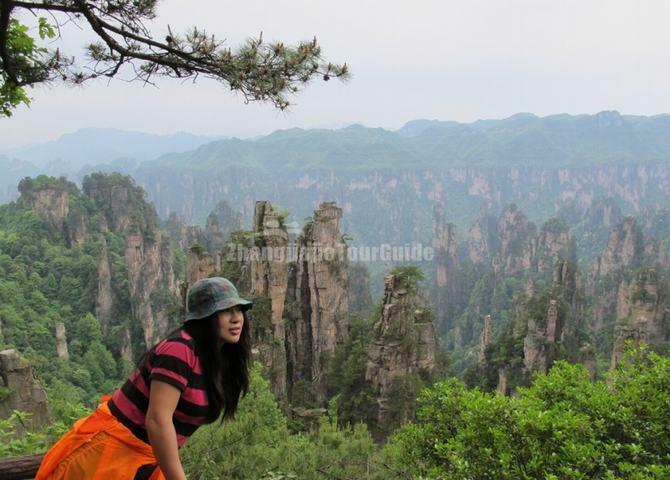 What makes it stand out is that, peaks and pillars there are nearly at the same height, which makes Yuanjiajie Scenic Area a mountain platform great for enjoying sweeping vistas. The area is accessible by two ways from foot of mountains: one is walking through Luancuan Slop from Golden Whip Stream Scenic Area to the Back Garden Scenic Area; the other is taking the Bailong Elevator, by trekking through the Baizhang Valley. When the elevator reaches the mountain top, Fields and Gardens in the Air will come into view. The mountain trail invites you to walk around the area and enjoy vistas. Major highlights in Yuanjiajie include Bailong Elevator, Fields and Gardens in the Air, No.1 Natural Bridge under Heaven, Hanging Waterfall, Mihun Bridge and Tujia Village etc. The Pipa Stream Scenic Area is famous for its leafy forest and unique rocks and peaks. It consists of the Couple Rock, Amah Peak, 9-floor Pavilion, Qingfeng Pavilion, Chaotian Temple, Longfeng Temple and some other highlights.